William Shakespeare's The Force Doth Awaken: Star Wars Part the Seventh - Moar Stuff - You don't need it but you know you want it. 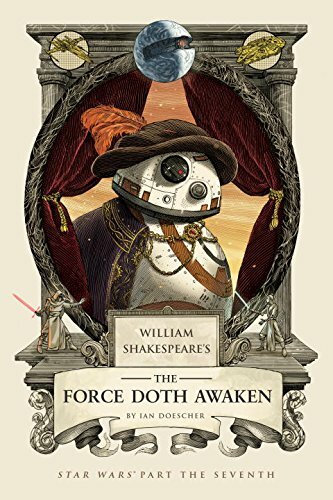 Experience The Force Awakens as a Shakespeare play, complete with Elizabethan verse, Shakespearian monologues, and theatrical stage directions with William Shakespeare’s The Force Doth Awaken: Star Wars Part the Seventh! Available for pre-order and slated for release in October. This book tells the story of how the noble Resistance clashes with the vile First Order as if it were written by the bard himself. Hear the story of Rey, Finn, Poe, Kylo Ren, and BB-8 in iambic pentameter! Star Wars fans and Shakespeare enthusiasts alike will enjoy the authentic meter, re-imagined movie scenes and dialogue, and hidden Easter eggs throughout. Chewbacca speaks! Leader Snoke gives a soliloquy! And the romance of Han Solo and Leia Organa takes a tragic turn that even Shakespeare would approve of. All with woodcut-style illustrations that place Star Wars characters into an Elizabethan galaxy. The story may take place in a galaxy far, far away, but you’ll be convinced it was written by Shakespeare! In case you didn’t know, this series has been around for a while and you can still get the earlier books. There’s William Shakespeare’s Star Wars. Followed by William Shakespeare’s The Empire Striketh Back and William Shakespeare’s The Jedi Doth Return. Technically, the prequels are available but never shall we speak of those.